The market has been so lovely lately. Our honey looks beautiful if I do say so myself.... The bear jars are super cute. The close up of the bouquet is one of my wildflower bouquets. Gaby looks beautiful among her flowers - Gaby's Babies - she grows for Vickie's Veggies. They're our neighbor at market. Beyond Gaby is the Chocosol tent. They have amazing chocolate as well as tortillas. On our other side is the coffee booth which I don't have a photo of but believe me it's great. Their coffee keeps me awake since I get up at 4AM to drive 2 1/2 hrs. to get there before market opens at 8AM. The drive home is the really hard part. I love our spot at the market. I know I've said this before but it's the Green Barns Market in Toronto on Christie south of St. Clair. Hours are 8AM-1PM. Here are some photos of the honey extracting process. First I use a very sharp knife (I cut my thumb yesterday on it) to cut the wax caps off of the honey comb. I'm holding a frame that has been completely uncapped. Then they go into the extractor. We have an electric one that holds 20 frames. The extractor spins the honey out of the frames and we put the empty frames back on the hives for the bees to fill with honey again. The wax we've cut off gets melted down in our solar wax melter and used in our beeswax lotions and balms. 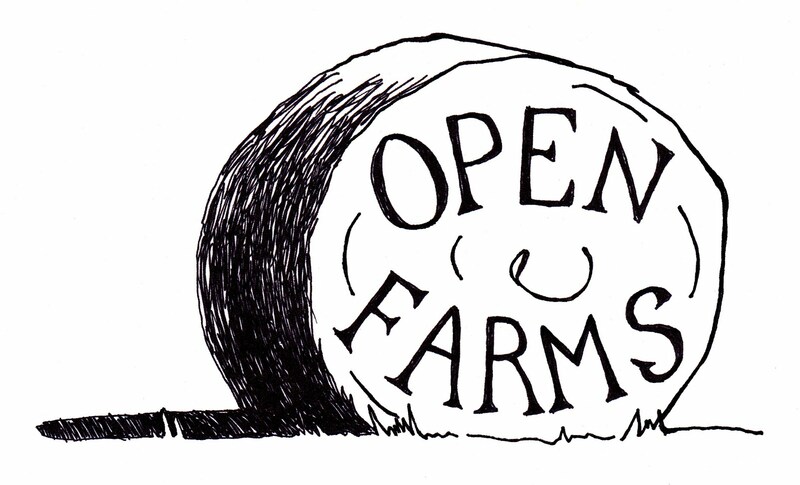 I recently designed this logo for a new farm tour in Ontario, Canada, called Open Farms. There's a tour by the same name in England and a group of farmers here decided to try it out. It's an organized tour of farms where people can drive around visiting a whole variety of farms to see where their food comes from. We're on the tour which is Sept. 19th and will be offering samples of our honey and herbal tea, tours of our apiary and gardens and straw bale farm house. 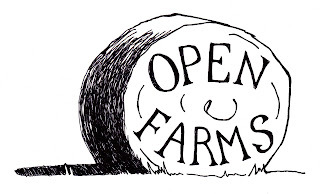 For more on Open Farms click here. Here is a honey bee on Russian sage. They have been loving the Russian sage and it's right by our front door step so I watch them all the time. In other news, we have finally started extracting honey!!! I don't have any photos yet but they're coming soon. We bottled the first of this year's honey crop today and will have it for sale at the market in Toronto tomorrow. I'm planning a honey tasting so hopefully the yellow jackets will leave us alone.